Supertreats carob bars look and taste as yummy as chocolate but are much better for you. Unlike milk, dark or raw chocolate, they are caffeine free and theobromine free and they also don’t contain any refined sugar. Available in three mouth-watering varieties. 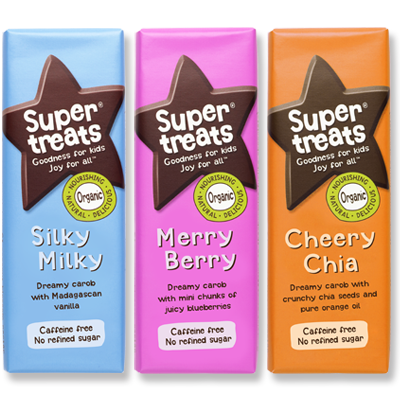 Supertreats carob bars look and taste just as yummy as milk chocolate but contain no refined sugar and are caffeine free and theobromine free. In addition they’re choc-full of wholesome goodness, supporting your natural vitality whilst satisfying your sweet tooth. They’re made from superfood carob and rich cocoa butter, gently sweetened with low-GI coconut blossom nectar, giving them a heavenly caramel taste. There are three delicious varieties available – Silky Milky, Merry Berry and Cheery Chia – each one combining dreamy carob with other superfood ingredients.